The symposium will run from 10:30 a.m.–4:30 p.m. on Saturday, March 1 in Rubloff Auditorium. It will begin with a talk by the artist. Ruscha will also participate in a conversation featuring cultural critic Dave Hickey and exhibition curator Sylvia Wolf. Lectures by art history professors Ken Allan and Thomas Crow will complete the day. Ed Ruscha is perhaps best known as a seminal American pop and conceptual artist. His iconic paintings of words, American landscapes, and vernacular architecture speak of his deep affinity for the commonplace. But the medium of photography has always been a source of inspiration and discovery. The eye-opening exhibition, Ed Ruscha and Photography , on view at the Art Institute of Chicago from March 1 through June 1, 2008, features Ruscha’s signature photographic books and dozens of previously unseen original prints. It provides the most comprehensive view of how photography functioned for this leading American artist. Organized in conjunction with the exhibition, a free daylong symposium on March 1 will include a talk by the artist, a conversation with Ruscha and cultural critic Dave Hickey and the exhibition’s curator Sylvia Wolf, and lectures by scholars Ken Allan and Thomas Crow. Organized by Wolf at the Whitney Museum of American Art to celebrate its acquisition of a deep collection of Ruscha’s photographs, the exhibition features more than 100 original prints, many of which have rarely been published or exhibited. Exclusive to the Chicago presentation of Ed Ruscha and Photography are an additional 13 paintings, drawings, and prints from the museum’s own outstanding holdings as well as from local private collections. Included in Ed Ruscha and Photography are original prints made for his photographic books: Twentysix Gasoline Stations (1963); Various Small Fires and Milk (1964); Some Los Angeles Apartments (1965); and Thirtyfour Parking Lots in Los Angeles (1967). In addition, the show features a striking selection from the more than 300 original photographs made during a seven-month tour that Ruscha took of Europe in 1961. In these images of Austria, England, France, Greece, Italy, Spain, and Yugoslavia, visitors will see the stylistic elements that have marked Ruscha’s work—signage and his strong graphic sensibility—in a context very different from the more well known Ruscha landscapes of Southern California and the west. These photographs are also compelling records of Ruscha’s experimentation with his camera. Another highlight of this exhibition is a selection of Ruscha’s photographic books of the 1960s and 1970s, which have come to embody conceptual artists’ embrace of serial imaging. These books have had a profound impact on the art and careers of many American artists, and they speak to the intermingling of Ruscha’s conceptual approach to imagery and photography as a medium. Lewis Baltz, Dan Graham, and Robert Venturi all cite Ruscha’s photographic books as highly influential, and the German photographers Bernd and Hilla Becher presented Ruscha’s work to their students, including the contemporary artists Thomas Struth and Andreas Gursky. Born in 1937 in Omaha, Nebraska, and raised in Oklahoma City, Ruscha moved to Los Angeles when he was 18. He attended the Chouinard Art Institute until 1960, before working briefly in commercial advertising. In 1961, Ruscha embarked on a career as an artist and produced enigmatic paintings, drawings, and photographic books of gasoline stations, apartment buildings, palm trees, vacant lots, and Los Angeles’s famous “Hollywood” sign. The irony and objective stance of his works from this period placed him in the context of Pop art and Conceptualism, but Ruscha consistently defies categorization. Now 70, Ruscha is recognized as one of our most important and influential contemporary American artists. The role photography has played in Ruscha’s career has not been deeply explored until now. What we see in Ed Ruscha and Photography is that the artist has consistently looked to photography, as a subject, a medium, and a vehicle, to inform his artistic practice. Ed Ruscha and Photography was organized by the Whitney Museum of American Art, New York. Edward Ruscha. 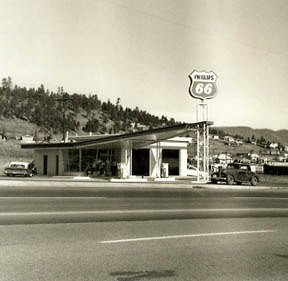 Phillips 66, Flagstaff, Arizona, 1962. From Twenty-Six Gasoline Stations, 1963. Whitney Museum of American Art, New York. © Ed Ruscha. You are currently browsing the archives for the Ed Ruscha category.